While I was working on a JSF and CDI example, I thought it would be useful to mention the steps required to create JSF and CDI Maven project. You can find the bellow steps to do so. Eclipse Luna that's shipped with the M2E plugin by default. So no need to install the plugin yourself. 1- Select from the main menu File->New->Other. Then select Maven->Maven Project. 2- Click the Next button and then check "Create a simple project (skip archetype selection)". 3- Write the Group Id and the Artifact Id then select Packaging as WAR. 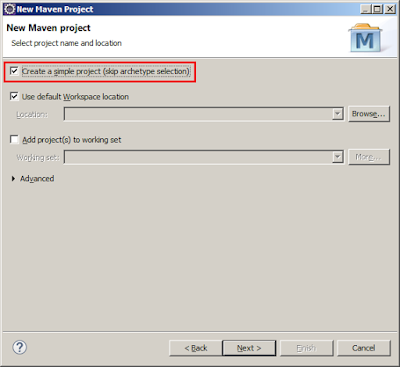 4- Click the Finish button to create the project with the bellow structure displayed in the Navigator view. 5- As you can see there is no deployment descriptor file (web.xml) as there is no WEB-INF folder. 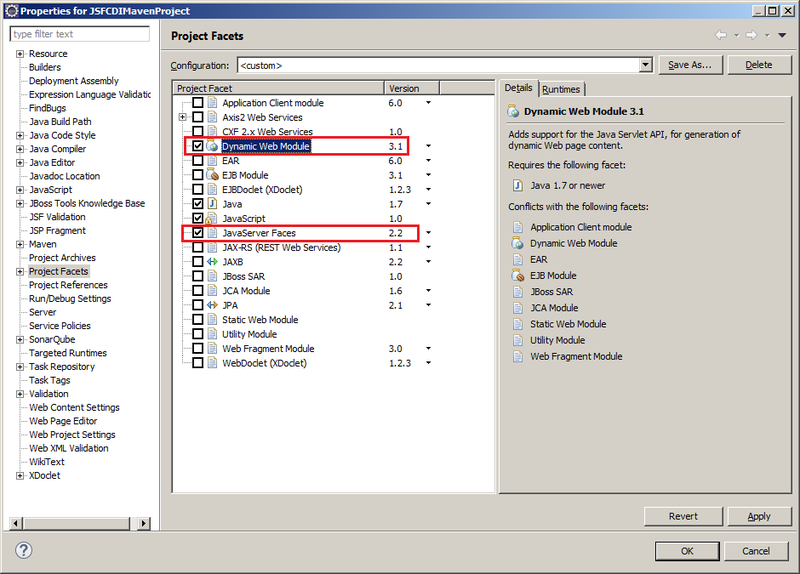 Also by checking on the Project Facets (select the project then ALT+ENTER then choose from the left menu Project Facets), we can see that the version of the Dynamic Web Module is 2.5 and the JavaServer Faces is not selected. So it's time to do some configurations to our project. 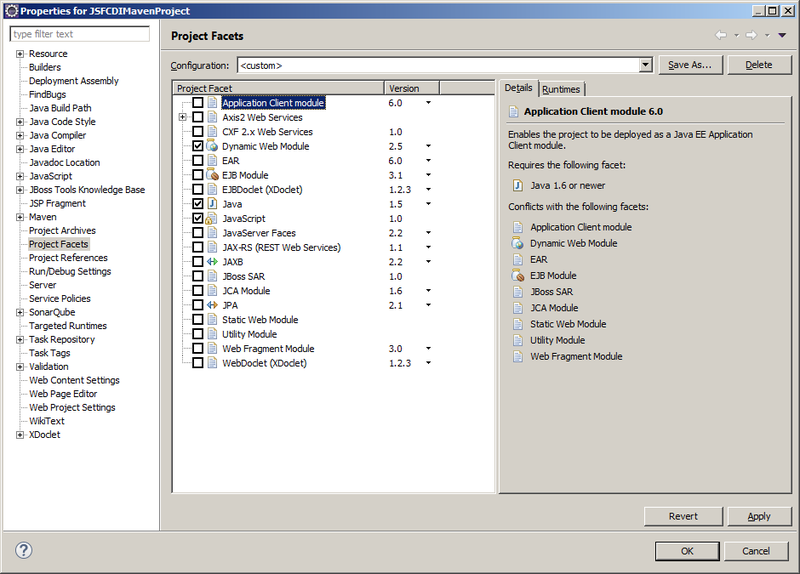 6- Right click on the project name then Configure->Add JSF Capabilities. 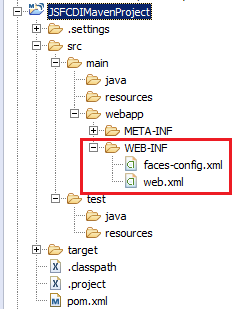 This will configure the project as JSF project and adds the WEB-INF with the web.xml and the faces-config.xml. 7- Adding the necessary API's as dependencies to the pom.xml. 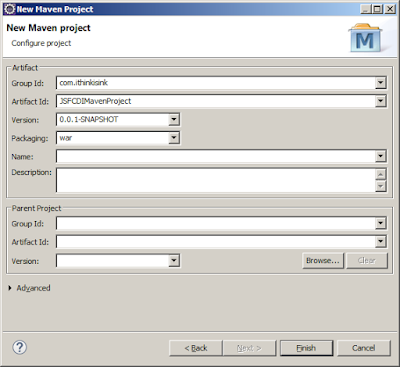 Also, adding the maven-compiler-plugin with version 3.1. 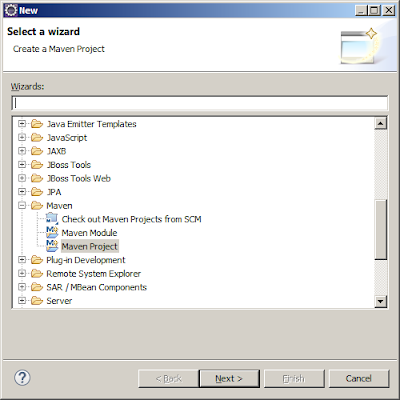 I have also pointed maven to use the Java compiler version 1.7. So here is the final pom.xml. 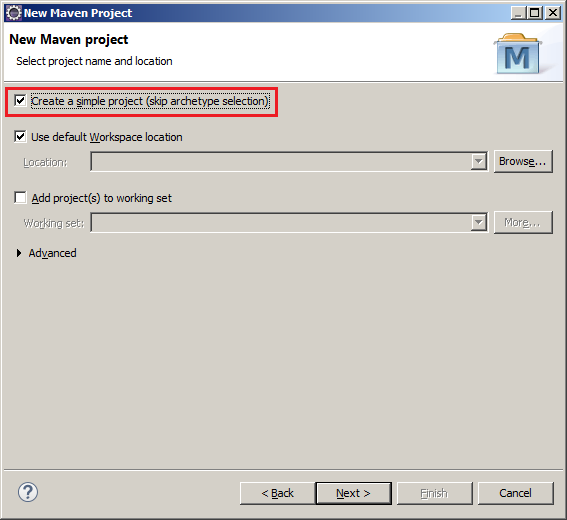 8- Now right click on the project name then choose Maven->Update Project to update the project with the newly added configurations. 9- The deployment descriptor (web,xml) has version 2.5 and we are pointing to the servlet 3.1 in our dependency. 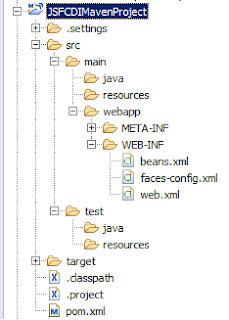 So as per Java EE 7XML schema, the namespace is changed to be http://xmlns.jcp.org/xml/ns/javaee/. This is the final web.xml after applying that change. 10- Check again the Project Facets. 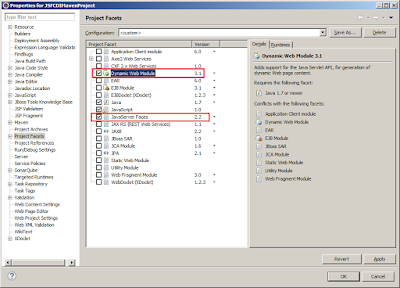 You can change the Dynamic Web Module for the version 3.1 and the JavaServer Faces is checked with version 2.2 as per the version added in the dependencies. 11- The last configuration that is needed is enabling the CDI context. This could be done by creating an XML file named beans.xml and add it to the WEB-INF folder as the bellow one. 12- Finally adding the project to WildFly and then starting the server. You will see in the Console view that WildFly started a service for the CDI deployment to the application. I have pushed this stub project to my GitHub and you can find it through the bellow URL. PrimeFaces Push is based on Atmosphere to establish WebSocket communication in an easy way. Bellow I will share the configuration to be able to do such kind of communication. 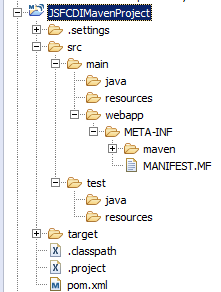 1- Adding the PrimeFaces and Atmosphere to the pom.xml for Maven dependency. Also, I added the dependency of the Apache Commons Lang3 to use the StringEscapeUtils while sending the notification message. <dependency> <groupId>org.atmosphere</groupId> <artifactId>atmosphere-runtime</artifactId> <version>2.1.7</version> </dependency> <dependency> <groupId>org.apache.commons</groupId> <artifactId>commons-lang3</artifactId> <version>3.4</version> </dependency> <dependency> <groupId>org.primefaces</groupId> <artifactId>primefaces</artifactId> <version>5.0</version> </dependency> 2- The web.xml configuration for the push servlet. I'm currently working in a project that we needed to implement such case. Assuming you are using MyBatis CDI in a EJB/CDI context, the bellow code will produce the MyBatis SqlSessionFactory for the MyBatis mapper files that are defined in a static way. I am a full stack Java EE Developer with a good grasp of key skills like Analysis, Architecture and System Administration. Through my technical years of experience, I was able to work with different clients and deliver a number of different scale projects. I delivered projects in a variety of domains such as inventory management, aerospace, finance and banking. I worked with small scale business clients to large scale business clients. Day by day I find out useful things that I would like to share with the technical community and keep them in an organized way that's why I created my blog (I think, I sink!) as a place to collect all these things. I hope one day it would be useful to a wide range of people. As a technical guy, I believe that it's very important and very useful to all of us to share the knowledge with the community in a way or another. I'm just trying to be a part of that idea.